Twestival Galway: House Hotel location. Follow the side street on the left hand side of the Quays pub. This road leads down to Flood street. On the right hand side as you exit the lane you should see the back of the House Hotel. The front of the Hotel is on Merchants Road. There is an entrance at both the Front and the back of the hotel. Labels: House Hotel, Twestival Galway. 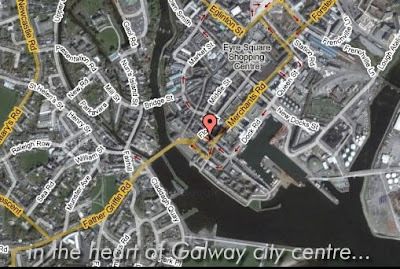 Last minute change of Venue for Twestival Galway! Who is coming to Twestival Galway?